Local SEO: Are Akron & Canton Businesses Ready? What volume of your business comes from someone searching on a mobile device? If you’re a local business owner in the Akron, Canton or Cleveland area, you may be surprised by the answer. According to a recent a recent study completed by Google, 94% of smartphone users have looked up local information and taken action as a result. That’s a huge number. It begs the question — Is your Website mobile ready? Maybe it’s time you (or your friendly neighborhood Internet Marketing firm) performed a Local SEO Audit. I’ve been saying this more and more lately — but your internet presence is more than your website. (way more). Your local internet presence is how you appear on a Google map. It’s how you show up on a search. It’s the reviews people leave for your business on Yelp. It’s the recommendations and feedback and anything and everything people say about you or your company on Facebook. And much much more. Trying to keep up with all the tumult in Local Search Marketing can be scary. Between Google Maps, Siri – iPhone Maps, and now Facebook ‘Nearby’, mobile marketing is going to affect the future prospects of your business. Like it or not. You need to know how your business is represented online. We already talk a lot about optimizing Google Plus Local and Yelp and Siri. And my bet is most of us are doing our best to catch up with just those changes. 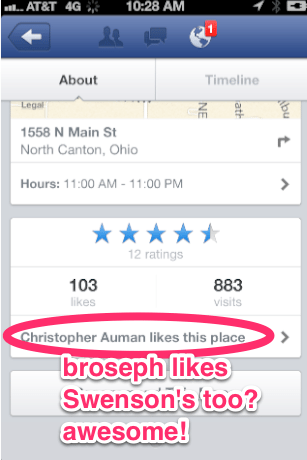 Now with Facebook entering the local search market, it’s really going to get interesting. What does this mean and where is this going? For good or for bad, Facebook is the most popular website on the planet. We’re way beyond simple search at this point. Even Google, which has always used a community approach to evaluate the importance of content, is using it’s social network, Google Plus, to refine and improve its search results. Increasingly, it will be your local community, your social presence and the reviews (good and bad) which determine how your business will be represented online. While the Nearby database isn’t yet as rich as Google, Yelp, or Foursquare, Facebook does have huge advantages — ie. the strength of its VAST community which can quickly flesh a wealth of content. Considering the average person has 229 friends on Facebook, what happens when one person shares their experience? You’ve got the potential for 229 people to instantly see that feedback AND for that feedback to show up every time they discover your product through a local search. Also, don’t be surprised to see local alerts showing up on your iPhone the next time you drive by a local restaurant or furniture store. I expect location + interest + network = special offers presented to potential customers in the very near future here. Need help? Give us a call we’ll be happy to give you a free consultation and talk about how local search and mobile marketing will affect the future of your business.